My ideal morning would be spent in bed, reading a book. The sun is sparkling in through the window, there is an aroma of freshly roasted coffee. My children are playing happily together. The birds are chirping. Failing that, I’d quite like just a little bit of peace and quite. I suspect mornings are bad for everyone, not just parents. Throw a bunch of screaming, maniac, octopus like children who don’t want to get dressed into “not fully caffeinated” stress of “parents having to get out of bed” and it’s enough to turn you grey. In order to survive this ordeal, you’ll need a plan. You need a morning routine. Big Hug. Give your kids a great big morning hug to tell them how much you love them. Routine. Have a routine and stick to it. You may need to tinker it from time to time, but work out what works best. Do your kids get dressed first, or breakfast first? It will be different for everyone but it can make SUCH a difference. My kids like to get dressed after breakfast, but that means they have to go up and down and up and down. And they are SO SLOW. The theory would be fine. The reality isn’t. Since they have started getting dressed first, they have realised that they have time to PLAY after breakfast. Wow. Shoe Tidy Hack. How is it that one shoe is upstairs and the other is hiding under the stairs? If you’re spending hours running around like head-less chickens then invest in a couple of baskets to keep your shoes in. Then hope that no one hides them. I have to confess, I’m not great at this but when I do manage it, the mornings definitely go smoother. My oldest son is getting very good at getting his clothes ready the night before. Get kit ready for any clubs, sports or activities. Get the table ready for breakfast. Mornings aren’t perfect. 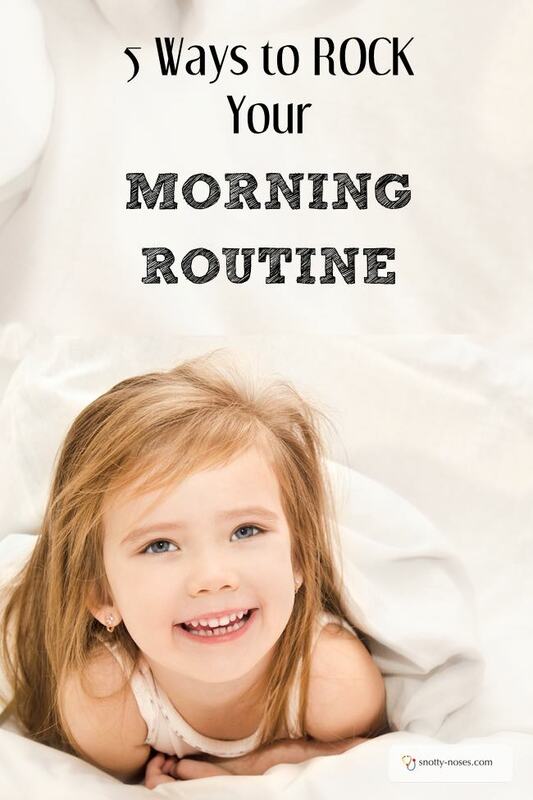 With kids there’ll always be some disaster, some commotion, some distraction that will scupper your careful morning routine. Like the other morning when three of my children all decided that they need to do a “you know what” on the toilet…just as we were about to walk out of the door. I’m not joking! But hey! That’s the fun of having kids!